the most website traffic and highest-quality leads for your budget. Monitoring your ad reports helps you identify key factors that can impact your performance. One such factor is Google’s Display Network. Many agents don’t realize that Google distributes your ads in two different ways: via the Search Network, which includes the Google search engine and partner websites, and via the Display Network, which presents ads on blogs, merchant sites, and any other sites that subscribe to it. Search ads are presented in response to search terms entered by the user, while Display ads are essentially the same as banner ads, presented at random. And due to its much larger size, most ads generate far more impressions on the Display Network. Display ads can sometimes be effective, but it’s clear that that Search ads usually drive more and higher-quality traffic to your website. In today’s AgentSecrets video event, we look at this important difference, and show you how to fine-tune your campaign settings to generate more ad impressions on the Search network. If you’ve been less than satisfied with your AdWords performance, this actionable content could give you the boost you’re looking for. Sign up today for the 30 Day Test Drive of the SuccessWebsite® Solution, and we’ll give you a $100 credit towards your first month of advertising on Google. Our AdWords-Certified specialists can help optimize your current campaigns, set up new ones, answer your questions, and get your Pay-Per-Click marketing on the right track. To get started, please contact me at Kristie@SuccessWebsite.com for more information on our Google AdWords Management program. One topic we’ve received a majority of questions about is Pay-Per-Click Advertising (PPC) and the best ways to achieve the maximum ROI from services like Google AdWords. As PPC becomes more competitive among real estate agents, the need for optimized bidding, carefully-selected keywords, and strategic campaign management continues to increase. In this installment, you’ll eavesdrop on an actual Google AdWords consultation call between me and SuccessWebsite® member Keri Shull. The call provides a valuable real-world insight into Keri’s business, and how she keeps new leads coming down the pipeline to feed her growing team of agents. Even better, you’ll see how her website integrates with her AdWords campaign to convert her ad traffic into leads – valuable information that’s often missing from other PPC educational resources. What do you think about Pay-Per-Click? Do you have any ideas, tips or success stories to share? Please add your feedback and questions to the comments below! 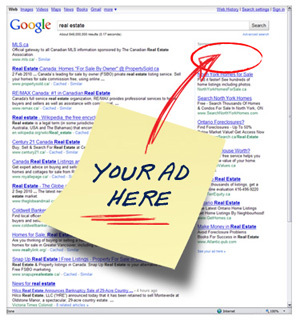 Pay-Per-Click Advertising (PPC) is intimidating to many agents, and it’s not hard to see why. There’s a whole different mindset involved in moving to a paid advertising model, especially when you’ve been relying solely on referrals or working with free online classified services like Craigslist. Return on investment (ROI) suddenly becomes a much bigger consideration. As a SuccessWebsite® Google AdWords Specialist, I spend a lot of time discussing ROI with agents, and optimizing their accounts to improve it. I recently recorded an interesting call between myself and SuccessWebsite member Keri Shull. Keri has a growing team that is hungry for leads, so it’s imperative that she keeps them coming down the pipeline. As usual, I applied our unique keyword selection and budgeting strategies to help her get the most traffic from her marketing budget. But, in addition to that, while reviewing the landing pages linked to her ads, we also discovered that Keri’s IDX page was actually bleeding potential leads away from her website! This example points out something very important. While the benefit of PPC is that you get guaranteed traffic to your website, remember that traffic doesn’t necessarily equal leads! There’s more to this process than just fine-tuning AdWords – your website needs to be optimized as well, to make sure you get the name and contact information from all those visitors. Put more simply, your PPC campaign is bigger than just the search engine it runs on. I find this point is overlooked by most PPC training. In my opinion, the best resources are the experiences of actual real estate agents, like Keri, who can show you how they’re using PPC in their businesses, and give you ideas on how to do it in yours. That’s why I’m happy to introduce our latest AgentSecrets Video Series entitled “Maximize Your ROI with Google Pay-Per-Click”. Part 1 of this FREE limited-release goes live tomorrow, Wednesday March 7th, at 2pm EST. In the first installment, broadcasting this week, you’ll eavesdrop on my call with Keri, and see exactly how we worked on her AdWords account, and improved the lead capture of her landing pages. Even better, we’ve included the follow-up call, and how the changes we made to Keri’s campaigns improved her results (and ROI). Then, over the next three weeks, we’ll expand on these PPC tactics, going further into keyword selection, optimizing your ad budget, ad targeting, and tracking your results with Google Analytics. And because Google isn’t the only game in town, we’ll also extend these ideas to other PPC services, Facebook, LinkedIn and Bing. We had an excellent response to our previous series on Craigslist, and this one is going to be bigger and better! Join us and find out how you can make Pay-Per-Click click for you.